Description: Combining the agility and manouevrability of a quadcopter with the lift and flight time of a fixed wing aircraft. We all knew each other from uni or school. I (Nathan) approached Anton the week leading up to the event to see if he was interested and he jumped on without a second thought. Hannah joined up at the brewery and Jolie joined the Saturday morning. What did you build at Hackagong? We designed and built using 3D printing a concept QUAD – Quadcopter Unified Aerofoil Design. The design fused the features of a quadcopter and a fixed wing aircraft. Why that idea and how did it come to you? Quadcopters are very popular among professions and hobbyists alike due to their availability and flexibility. The biggest issue regarding the vast majority of users is its flight time. With the Hackagong event fast approaching and no solid ideas we were keen to come up with something innovative and ambitious. Over a coffee by the beach we were captivated by the seagull’s ability to harass people trying to enjoy hot chips with such little effort in flight. It was just the inspiration we needed. Why not give the quadcopter wings! 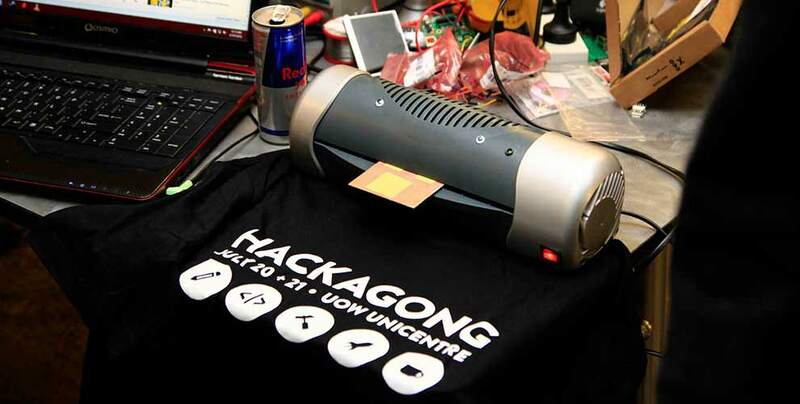 In Australia, Hackagong is a hackathon where you form a small team mixing designers, programmers, engineers, entrepreneurs, game creators or anybody with an idea or problem to solve, and build a technology driven product or service prototype in 30 hours. Hackagong was started in 2012 by Nathan Waters along with other volunteers (primarily UOW students). Hackagong 2015 is run and organised by the University of Wollongong Information Technology Society (WITS) and a group of independent volunteers. The event is funded completely by corporate sponsorship and funds from the UOW Centre for Student Engagement. Hackagong is a grassroots, non-profit event setup with the mission of igniting startup and maker communities in the Illawarra and surrounding regions.